In Florida one of the treatments for dry wood termites is tent fumigation. Tent fumigation is the process of “tenting” a home so tightly that the air inside is controlled completely. The house is prepared prior to the tenting to ensure the tent has a good seal, and any items that need to be removed or wrapped to protect from the fumigation gasses are prepared properly. Once everything has been prepared, fans are placed inside of your home to help distribute the fumigation gas. This gas is so small it can pass through the wood, finding termites and stopping them. It won’t matter if the termites are in the attic, or if they are in a closet, they will be found. Making the decision to tent a home is an important one. Consulting with the experts at Magnum Termite and Pest Control, you will be able to make the most informed decision possible. We can help to explain your options and we know when the best course of action is tent fumigation. 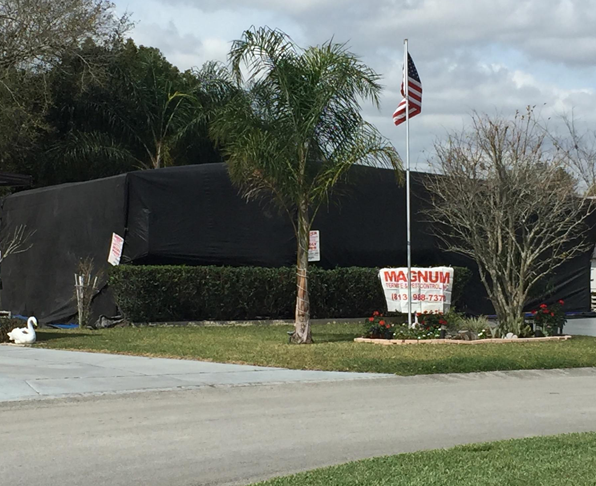 Magnum Termite and Pest Control serves the Central Florida area to assist with expert tent fumigation. 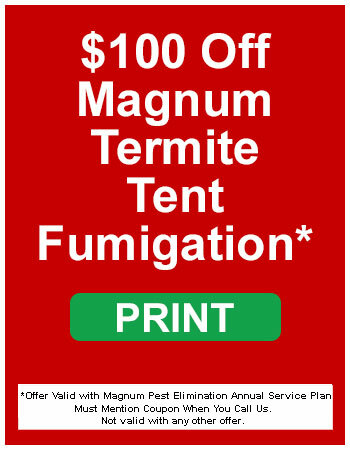 Magnum Termite and Pest Control prides itself on understanding and knowing when tent fumigation is the best possible solution. It is our goal to provide you with the best service possible. If you have recently seen evidence of termites in your home, contact us quickly. It will take an expert to decide if tent fumigation is your best possible solution. Finding the termites is important. Treating the termites is the only way to ensure they won’t continue to damage your home.